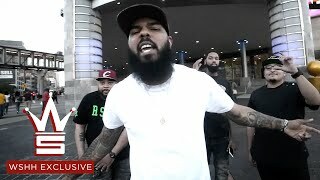 One of the few Midwest rappers signed to Rick Ross' Maybach Music label, Ohio's Stalley made his debut in 2008 on Terry Urban's Goin' Ape mixtape. Born Kyle Myricks in Massillon, his aboveground debut came in 2010 when he landed on Curren$y's Pilot Talk album, while his appearance on the 2011 compilation Self-Made, Vol. 1 launched his relationship with Maybach Music. An appearance on Self-Made, Vol. 2 followed in 2012. A year later he released the Honest Cowboy EP, while his debut album, Ohio, followed in 2014. Ohio featured appearances by Nipsey Hussle, Rick Ross, August Alsina, Ty Dolla $ign, and De La Soul. The following year, Myricks issued The Laughing Introvert, his sixth mixtape. Saving Yusuf arrived the next year, featuring a handful of collaborations with Goldie as well as Chuck Inglish, Rashad, Big K.R.I.T., and more. His sophomore LP, New Wave, was issued in the summer of 2017.